Much of the original code for the fallout3/nv version of Wrye Bash is from valda - thanks! Wrye Bash 307.beta3 or higher. Important: Wrye Bash needs developers. If you are familiar with the Python programming language, please consider helping with development. We ported our repository to git at github to make contributing super easy. Our bug tracker lists everything we're aware of at present. Purpose of FO3/FNV versions compared to Valda's Versions. Awareness that partial FO3/FNV support has been added to 307. Reiterate that Python volunteers are needed to update remaining patchers for full functionality. Explain the main differences between Valda's versions and 307. Continue stabilizing and testing current FO3/FNV support. There are so many authors that have contributed to this project like Wrye (the Main Snow Monkey Himself and author of Wrye Mash), Pacific Morrowind, Lojack, Valda, D4id4los, Sharlikran, raziel23x, and WrinklyNinja. Without the continued effort from Utumno to refine, stabilize, and update the back end code Wrye Bash would not be what it is today. However, volunteers are still needed to add full multi game support. In 2014 Sharlikran started experimenting with updating Skyrim, Fallout 3, and Fallout NV record definitions with the help from Lojack. The FO3/FNV record definitions have been used in Valda's versions but are only now being implemented into 307. Currently some record definitions are not implemented properly for Skyrim and Fallout 4 as they require custom code for the more complex records. Fallout 3 and Fallout NV have the custom code for its records but need additional work on converting Oblivion patchers to provide multi game support. Oblivion, Fallout 3 and Fallout NV have similar records and patcher requirements so patcher support for those three games is much easier to implement. Skyrim, Skyrim SE and Fallout 4 have similar records and patcher requirements but they will need custom alterations to existing patchers. Valda based his versions off of 295 and implemented some additional code from newer versions. Because of that Valda's versions have no LOOT support for importing Bash tags. (307 does have LOOT support) You can still sort with LOOT separately. During the interim until more patcher support is added to 307, additional updates to Valda's versions will be made. Currently monitoring external installations is being worked on for Valda's versions. The patcher differences are as follows. Only patchers highlighted in green are available in 307.Beta3. Valda's versions patch: Merge patches, Replace FormIDs from CSV files, Import Actors (AIPackages, Animations, Death Items), Import Cells, Import Destructable, Import Factions, Import Graphics, Import Inventory, Import NPC Faces, Import Names, Import Relations, Import Script Contents, Import Scripts, Import Sounds, Import Stats, Import Weapon Modifications, Globals, Tweak Settings, Tweaks (Assorted, Names), FormID Lists, Leveled Lists, Race Records. Version 307 patches: Merge patches, Import Cells, Import Destructable, Import Factions, Import Graphics, Import Inventory, Import Names, Import Relations, Import Sounds, Import Stats, Import Weapon Modifications, Tweak Settings, FormID Lists, Leveled Lists. As you can see continued work is needed but 307 for FO3/FNV is not as limited as it is for Skyrim, Skyrim SE and Fallout 4. (Updated Fallout 4 records are being worked on) What we are hoping for is continued feedback on current functionality with Fallout 3 and Fallout NV to ensure it is as stable as possible. While Back end code continues to be refactored issues to refactored code will be handled by Utumno but any minor updates to patchers and all updates to record definitions will be done by Sharlikran. So please share your feedback in the comments section. When a simple comment, update, and testing is not sufficient please do as asked and post in the official GitHub bug tracker. 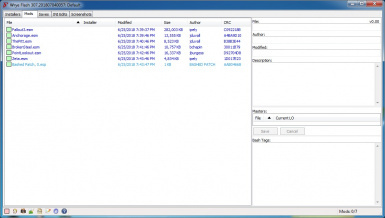 Migration information and links to Valda's Wrye Flash. What does Wrye Bash do? 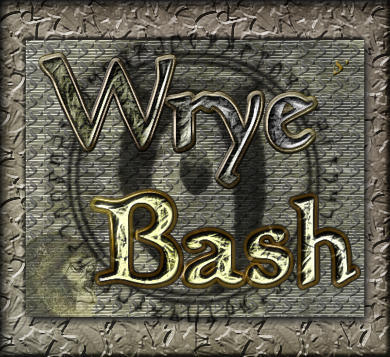 Wrye Bash is a powerful mod management utility for TES IV: Oblivion, TES V: Skyrim, Fallout 4 and TES V Skyrim SE. .ini and settings files tweak management. It makes more mods compatible with each other by importing information from different mods into a "bashed patch"
Please give feedback and feel free to join the discussion at the current official thread: Wrye Bash (Oblivion, Skyrim, Skyrim SE, Fallout 4). Be sure to read the first post for information on installation, troubleshooting, reporting bugs etc. If you are having trouble, you'll find many friendly people there who can help. Check out the 2nd post to see the list of known bugs, and, more importantly, whether the bug has already been fixed. The General Readme can be launched from inside Bash by clicking the question mark icon on Bash's toolbar. Just use the installer and install to the Fallout 3 folder! When you install dependencies, just install them to their default locations. There are two versions available: the Python version and the Standalone version. They are functionally equivalent. Most people should run the Standalone version since it is slightly simpler (no external Python components to install). The Python version, however, allows you to follow the rapidly developed code and is therefore preferred. Dependency installation for the Python version will be handled automatically by the installer. However, if you want or need to do things manually, see the installation sections on the General Readme for information, and the Advanced Readme for detailed instructions. Remember! In Windows Vista and up, don't install Skyrim Special Edition in the Program Files folder due to User Account Control! For changes from all previous versions, see the Version History.